Cheaty Mages is about mages who have gathered to spectate (and manipulate) a grand duel of monsters. The mages observe the monsters entering the arena, place bets on who they think they will win, then they cheat for their gladiator of favor. The goal of the game is to have the most money after 3 rounds of fighting. Before the fighting starts, the players need to place bets. You are given betting tickets to make your choices. Your can pick anywhere from 1-3 gladiators but the more you pick, the less the payout. 1 ticket – Double the reward stated on the monster. 2 tickets – Equal to the reward on the monster. 3 tickets – Half the reward on the monster. You are not required to show what you picked, as you want to keep your competitors guessing. However you do need to show how many tickets you picked. Once picks are in place, players take turns casting spells at the monsters. Spells have a mana power (not cost) and a spell type. These are important, as it can be directly effected by the judge that is in play. Most judges have a mana limit, so if enough spells with a high mana total are placed on one monster, the judge may dispell the spells or take the gladiator out altogether. Also if the judge disallows a certain spell type, you are not allowed to use those spells during the fight. Most spells are direct effect, meaning you place the spell face up next to the monster for everyone to see. There are also enchantments that let you place spells face down next to the monster to keep your opponents guessing what you casted. There are both positive and negative spell effects that can be used during battle, amongst other spells that help you cheat. Other options mages have during the spell casting phase, is to Pass or they can discard a spell to Identify Magic. If a mage passes, they are done for the fight, meaning they will hold onto their spells until the fight is over (these can be saved for the next fight). If a player chooses to use Identify Magic, they discard a spell to look at an enchantment that is face down. When everyone is done casting, the spells are totalled up to see who the victor is. At first I was pretty skeptical of a (yet another) card game that I never heard of, but I had a lot of fun with it. It’s small and portable, the judges add a fun dynamic to card battling, and the gambling adds a nice alliance/nemesis feel where you need to find out who is helping you and who is not. It’s not uncommon to place your spells on creatures just to make your opponent think you bet on that monster, which adds some more fun and trickery. This game is also easy to learn, most of the things you need to know are already on the cards. So in conclusion, the game is inexpensive, easy to learn, fun for everyone, what are you waiting for? Ascension: Return of the Fallen is a great addition to the original Ascension: Godslayer. For an review of the original, refer to my post under Ascension: Godslayer. This expansion adds new cards to the portal, with the introduction of “Fate.” Fate is an ability that is played as soon as the card hits the line up. These often modify the line up in some sort of way or benefits players by having them draw cards, discard cards, or even gain new cards. All without having to purchase the card from the lineup. Scoring rules have been modified from the original in this game. However this isn’t a huge deal as the other Ascension games have adopted the format given in Return of the Fallen. Also while there are several new cards that this set brings, the “Boss” of this expansion adds the ability to add monster cards to your deck instead of discarding them into the void. These monster cards provide attack to your deck. Final Review: I fell that this expansion adds a lot to the original game. The original while very fun, is basic and can get a little bland after awhile. My opinion is that this expansion adds the right amount of synergy between cards, as well as adds new rule additions that make the game more fun but not too complicated that new people cannot play. Ascension is based on a portal that is releasing Monsters into the world. Your job as a wizard, is to recruit allies who are also being spat out by this portal to help you vanquish the enemies. The game consists of a starting deck of weak cards, that is used to gain/kill weaker cards. There are attack cards, used to kill the monsters in the middle row or the cultist. Then there are Rune Power cards that are used to purchase other cards to use in your deck. There is a portal deck, a void, middle row of six card spots, heavy military, oracles, and a cultist. At all times, the middle row is filled with cards by the portal deck as cards are removed or defeated. Monsters defeated or removed cards will typically go to the void unless instructed otherwise. Heavy Infantry is a beefed up attack card and an oracle is a beefed up rune power card, which can be purchased at any point. Cultist is a monster card that can be killed at any point for honor. Aquired cards consist of Heros and Constructs. Heroes are one shot cards, once played you exhaust the beenfit and at the end of the turn it is discarded. Constructs have the ability to stay in play and give you their benefit over several turns. – The art is very unique. I tend to like it, but I’ve also read other reviews where people are less appreciative of it. – Like Magic the Gathering, the cards have themes/colors which the card powers are usually based on. Example: Void cards are known for being able to get rid of cards in your deck. While Enlightenment will allow you to draw more cards. – Cards are of good quality. Thicker cardboard and laminated. – The game has expansions and you don’t need to waste a ton of money on packs of cards. These are one time purchases. – Some people don’t like the randomness of the portal. There are times when there is nothing good in the middle row, and then as soon as you buy those cards, the middle row fills with better cards for the next player to take advantage of. – Depending on which version of the game you are playing, it seems that different colors are more dominant than others. I’ve tried a few TCG drafting games and they were really fun when I played them. Ascension does a good job of taking the elements that I liked from that style of play and making a board game out of it. Since then I’ve opened up to other deck building games and I feel that this game holds a good balance from deck builders that are too simple and others that are more elaborate. My main issue with this game is that once you’ve practiced the game enough, it starts to become clear what strategies are clearly better than others. I like to have options where I can stray from the norm and still be able to come out on top. That being said, I find this to be the problem with most deck building games and Ascension has had more options than some of the other deck builders I’ve played. In the end Ascension is one of my first and still favorite deck builders. I would recommend it to anyone who is into fantasy (even a little steam punk) themed games, and has an appreciation for deck building. Batman: Gotham City Strategy Game is a game where you play as the villains of Batman, to lay your claim on the city of Gotham. You are tasked with building your reputation by leveling, hiring henchmen and creating threat to several blocks. During this time you will complete with other villains for control, as well as fending off Batman when he comes to reclaim his city. The objective of the game is to reach level 10 with the chosen villain. Each level up requires something different such as paying an amount of money/information, owning a number of blocks or having a certain amount of henchmen. Every so often, the levels also give your villain new abilities to help you better your opponents. Laying down threat on blocks is how you take control of blocks, henchmen help you fight as well as count as threat for blocks, money is used to buy henchmen and information is used to move around the map. Every turn you get cards that have 2 parts, in which the top half is always played and the bottom is optional. The top is either a resource gain for the owner of a block or it activates batman. The bottom half is a quest that you can either complete to gain the benefit or you can opt to not play the quest and gain 2 resources of your choice. When Batman is activated, he has his own deck where you pull a card to see what he does within the city. If given a choice as to where to put batman, the player of the card gets to choose. -If you’re a fan of Batman, it’s fun to nerd out on the villains and their abilities. Each villain has their own abilities, and that plays into the strategy that you need to use to control your blocks. -The game has a lot of nice pieces. There’s nice minis, cards, screens for each villain, custom dice, and personalized markers for each villain. The minis are also made so you can play the heroclix game, with changeable dials and cards for that particular game. -Batman plays well into the game. If you want to fight batman, you have your opportunities to do so, but as a villain you have to remember that in the end Batman always wins and will eventually get to a point that he’s unstoppable. -The game over stays it’s welcome. It starts out great and moves fairly quickly in the beginning, but it eventually hits a grinding halt towards the end making the game drag out. You could be ahead of the pack, but when you get towards the end the objectives take forever to achieve and everyone catches up. This makes the final objective of owning 7 blocks to take forever. -The end is anti-climactic. This might be due to the first con I pointed out, but when you end the game you just feel like there should have been something else. -Movement has no logistics. To move in this game, you pay one information and you can move your villain+all your minions anywhere on the board. I found that as a strange mechanism of the game being that they made this big map of Gotham, makes me feel movement should be similar to a Risk game, so you know the potential areas that can be invaded next. As you can see by the cons, I didn’t have very many to list but having a fun end to the game is ultimately what’s going to leave a good or bad taste in your mouth at the end of the day. The game has some elements that really made me feel like this game had a lot of potential and could have been so much better. Needless to say, I was quite disappointed with how it played out. The few games that I have played ran for maybe 2-3 hours and for what the game has, that time just isn’t worth it. I have read a few forums where the developer of the game has been looking into making a game variation that is shorter, so that could be promising. However, I would not recommend the game to anyone as it is out of the box. The story of Mice and Mystics is of a King who has fallen under a terrible curse, and a group of loyal followers who magically turn themselves into Mice to escape and attempt to save the King. Unfortunately for the Mice, the enemies have caught onto their plan and have also been transformed into miniature size to follow and capture them. But don’t forget about Brodie the cat! Mice and Mystics is a simplified version of what would be a table top Role-playing Game. Every player has a character(s) that they play. Each character having their own classes/armor/abilities that they can use through the game. When playing, you will be provided with a chapter of the book to play from. Each chapter details the story, provides scenarios, win and lose objectives, and sometimes even an after story if the participants succeed. Even though the game is a simplified table top RPG, it still has several rules and moving parts, yet it still holds true to table top RPGs. For example, the story and character personalities are there, you still roll dice for combat/movement, spells and range require line of sight to your target, etc. -The Story is pretty awesome. It plays well to give you immersion and character coloration. Very enjoyable for all ages. -The pieces to the game are well done. The Minis are detailed, but left uncolored for painting. Dice are unique to the game but have a nice design. Then you have character cards, ability, cards, and several tokens. The list goes on. -Each chapter provides unique encounters, each of which need to be played differently. For example, in chapter one, you go from basic fight to helping Ms. Maggie (human cook) fight off roaches. Unfortunately Ms. Maggie is unaware all of you are mice as well and she becomes part of the encounter. -There is an achievement system (acheesements) that provides benefits to the players and party. -The game is miniaturized. What I mean by this, is that everything has been structured to mouse size in an imaginative way. Tiles have been made so that you can weave in and out from underground areas. Even new equipment is make shift armor made from small objects like coins, walnut shells and fish hooks. -The biggest gripe of this game is the rules. As a table top RPG player myself, I found myself going through the book several times to get the rules right. Even then I had to check forums and FAQs for clarifications because the game has so many moving parts that often clash or become hard to keep track of. Don’t get me wrong, it’s not like going through a 200 page player’s handbook, but the rules are still much more elaborate than a basic board game. -Alpha gaming. Those of you not familiar with this, it is when a dominant personality attempts to take over everything what everyone is doing. This issue doesn’t really come up in my group, but there is always a possibility of this happening in any coop game. -A bit of power gaming imbalance during moments of the game. To succeed you must progress your characters. Some characters will get their items/abilities much faster than others, this can lead to some characters being much more powerful than others in the party. However in the longer run, everything will even out as there is only so much you can get. -Limited dice. 5 dice for 4 players is annoying to put it bluntly. Most times, you need 2-3 dice for a basic attack but then you get abilities and equipment that give you more dice to roll. Considering you have to do attacks/defense for every character and enemy, the passing of the dice gets a bit annoying. -I would recommend a set party of four. Technically you can play any chapter with any random group of people that are willing the play, but this game would be enjoyed most if you have the same people developing their own characters and playing the story along side you. While Mice and Mystics is a very rule heavy game, this is really just the nature of a table top RPG game and I don’t blame the developer of the game at all for needing to clarify the rules through forums and FAQ (most table top players know this). That being said, this is easily one of my favorites. While I don’t want to judge the story until I find out the ending, the story so far has been enough to develop personalities, scenarios and encounters. This is a game that kids will easily love, but they would need an adult to administer the game and RP the dialogue with them! Even in a group of adults, I play with my 3 friends and we all enjoy it. As said above, I like to keep a set party for the game, so we plan a day that we can all meet and play together. But I have to resist every urge in my body to read ahead. Then during game nights, it’s well worth it. Citadels is a game where the objective is to create enough districts to complete your citadel. There are 5 types of districts (noble, religious, military, trade, and special) each symbolized by a colored icon. Each district has a gold cost to create a building, and at the end of the game, the gold cost of the building becomes the point value for determining who wins. When someone makes a total of 8 districts, that flags the final round for all the players. Bonus points are given if achievements are met, such as being the first to get 8 districts, having 8 districts by the end of the game, and/or having one of each district type by the end of the game. – Take 2 district cards from the top of the deck, choose one to keep and the other on the bottom of the deck. Each player is limited to building 1 district per turn. Role abilities can be used at any point during their turn, as long as it’s not associated with another action. 1. Assassin – First in the round, names a role to assassinate. That role is unable to take a turn. Role killed remains face down until the end of the round. 2. Thief – Names a role to steal from. Role named loses all their gold to the thief at the beginning of their turn. Thief is not allowed to pick the Assassin or victim of Assassin. 3. Magician – Able to swap any number of cards from their hand to draw that many cards from the deck or you can trade hands with another player. 4. King – Takes the crown (meaning you pick from the roles first next round and you must narrate the next round). King is also able to collect 1 gold from noble districts you own. 5. Bishop – Protects your districts from the warlord. Collects 1 gold for each religious district you own. 6. Merchant – collects 1 extra gold after taking a basic action. Collects 1 gold from trade districts you control. 7. Architect – Draws 2 district cards after taking an action. May build up to 3 districts this turn. 8. 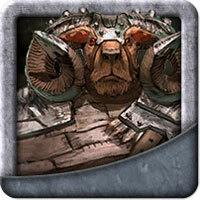 Warlord – Can destroy districts by spending gold equal to cost of the district minus 1. Also collects 1 gold per military district you control. (Special Note: Special districts normally have special abilities which you can also used to help you gain an advantage over others). – This game comes in a very small box. Easy for carrying and traveling. – The game is pretty simple to pick up after showing the process of 2-3 rounds. – There is lots of harassing that occurs in this game. So that’s a plus if you like grieving other players. – Being able to pick your roles each round is nice, so you are not stuck with one role the entire game. – Special districts give an added variable in addition to choose role abilities. – Card quality could be better. It’s cheap cardboard that seems to absorb hand moisture, almost forcing you to get sleeves. – The role of the king can be humorous at times, but during other moments the role will be passed to someone who is not as experienced with the game or someone who is shy and you must bear them fumbling through the round. Not that big of a deal, but can slow the pace of the game sometimes. – The rule book has variations that fit 1-7 players. But anything below 4 players is really not worth playing. The first time I played this game, I had a lot of fun. Then after seeing how small and convenient it was to carry around, I was pretty much sold. For the cons, I was tempted to say that the game might be simple for some players because the rules are not that elaborate. After all, the most confusing part is knowing what you can do as each role, but it is explained on the card. But don’t be fooled. A lot of time and thought is still put into choosing your role and planning for opponents’ moves as well. Honestly, I feel this game has something for everyone and is definitely worth trying out. When someone offered you to try X-Wing for the first time and you got addicted and it ruined your life? I’m kidding, kinda. X-Wing Miniature Base set is a minis game where you are provided 3 miniatures as a starter set. 1 X-Wing and 2 Tie Fighters. First you need to determine a skill level threshold to pick your pilots. This is important for balancing because 2 really good Tie Fighter Pilots might not be a good matchup against one X-Wing Pilot, depending on the skill level. Some ships can have upgrades, providing extra actions or attacks to your ship. There is no game board, so you can use any flat surface to play the game, as long as there is enough room. Make sure you designate boundaries as well, because if a ship flies out of the boundaries, the ship is considered leaving the battle and is immediately destroyed. Each round is composed of 3 phases. Move, action, and attack phases. – Moving: Pilots with the lowest skill move first. You are provided with a wheel that shows what maneuvers are available for your ship, which you use to pick your move action. There are maneuvers that are more difficult, and put stress on your ship, as well as maneuvers that are easier and relief stress from the ship. When movement is decided, you use a measure stick to show where your ship ends their space. There are certain rules for overlapping ships as well. – Action: During this time, the pilots have the option to choose what kind of action they want to prep for. Most common actions are focus, evade, and barrel roll. On both defense and offense dice, there are eye ball symbols. If you have a focus, focus token can change one of those to a hit or dodge, depending what you are rolling for. Barrel Roll is a immediate side maneuver to help you dodge or get a better angle. Evade token counts as 1 auto dodge for your ship. – Attack: Lastly, the highest piloting skill attacks first. Both Tie Fighters and Xwings can only attack things in their front cone. and you also have to measure distance of attack. Further you are, the harder to hit and vice versa. There are also missile attacks that do different types of damage. X-Wings come equipped with more weapons and they have shields. Tie Fighters have less on the ship, but have more maneuvers that they can perform. – Being that I’ve never really played mini games before, I found this very refreshing to the mix of board games that I have. – It was able to carry the space combat pretty well. At times, you really find yourself developing strategies of where to move next, either because you are chasing someone or because you need to get away. – Cool Minis play to fans. – Good number of variations on pilots, upgrades, and actions. – My biggest gripe on this, is that while the X-Wing and Tie Fighters are enough to get a feel for the game, you feel like you’re missing out by not having other ships. This is a game that will take a hefty investment, especially if you are soloing the costs. – The majority of the movement during combat is actually pretty awesome, but at times it can get clunky especially when the ships are too close. The overlap rule settles the disputes, but this can sometimes take away from the game. Unfortunately this seems to be a necessary evil of the game. – No board to play on. I guess you can say the world is your oyster, but they literally give you nothing to play on, not even poster paper that has stars on it. Overall, this game was really a lot of fun. I enjoy the dynamics to the game and the options you have available. This is a game when after playing for the first time, I seriously thought about getting some minis to make more epic battles but it’s A LOT of money compared to other board games. Players who are more familiar with mini games might be used to such costs, but not all board game fans are looking to spend that much. This is a game I would recommend people to try, but it comes with a “buyer’s beware” for cost of game + expansions. Catan is a game of supply, demand and development. Everyone initally starts 2 settlements that are strategically placed on the corners of lands that are represented by hexigons. These hexigons are designated numbers and when the numbers are rolled, you are permitted to collect resources that those lands provide as long as you have a city or settlement that resides on it’s borders. These resources are then used to build other things such as roads, settlements, cities or city walls. You will often times find that you are lacking a certain resource to build. During times like this, you are allowed to barter with others to complete your goals. This game has always been a favorite of the group. My primary enjoyment comes from bartering with people at the table. It really gets people to start conversations and even people who are a little shy will come out of there shells to grab a deal. I will admit that the basic version of catan could use a little more flavor but the expansions definitely add to the overall enjoyment of the game. I would recommend this game to all players who are casual or experts, who are able to make a step up from monopoly. 4th Edition D&D is the most recent D&D edition that was released. 3.0-3.5 caters more towards veteran players and some have not enjoyed the new rule set and design structure, as 4.0 caters more towards new players who might be interested in playing but always found it intimidating. The following are my pros and cons to 4.0. – A lot of the number crunching and options from version 3.0 and 3.5 were narrowed down to simpler options and mathematics. – All classes have been modified to have certain abilities/spells that are close to equal with one another in terms of strength. This balances each classes involvement during combat. – Provoke/Taunt abilities were added. This is primarily a tank power in video games, but they have added this ability to 4th which gives tanks the ability to actually force the issue of having enemies attack them instead of others. – Support classes are defined more in this version. Previously it was just tanks, damage, and heals for the most part. However, 4th has brought out the support class a bit more, giving them more abilities to assist the party. – Less options. 4.0 changed skills to more of a talent tree style of choices, where if you are a certain specialization, there is a clear cut choice for you. In older versions, you were on your own to figure it out with several options to build on. – While the class balance is nice, it also feels that it takes away from what really defined the classes of the original D&D. Melee used to be created by the physical traits and training that they took and magic users are defined by the spells that they study. But now everything feels like a spell of sorts. In my opinion, I didn’t really feel that 4th was as enjoyable as playing 3.5. But I will say that 4th is enjoyable enough for me to play. 4.0 feels like it’s taking a step back for veteran players, but it is really simplified for new players to the game. This seems to be Wizards of the Coast attempt to market to new players, but unfortunately it made a lot of veterans unhappy with the changes in structure. I would recommend 4th to new comers to D&D, but veteran players would most likely stick to 3.5. Lots of people have already experienced being adventurers in D&D, where a rich noble hires you to take on quests that provide you with treasure and gold. Now what if you actually played the noble that hires the adventurers? You get Lords of Water Deep. Note: This is not a D&D adventure game for those of you who were hoping for one. In this game, everyone represents a noble with agents. Your identity is secret to only you until the end of the game and your agents are used to do your bidding whether it be investing in buildings, recruiting adventurers, seeking quests, or even doing your dirty work (intrigue cards). Each player takes turns placing these agents around the city to help achieve their goals. These goals usually entail making buildings or completing quests of a certain type. To win, you need to have the most victory points by the end of the game. These victory points are “usually” given by quests and making buildings, but there are a few exceptions such as intrigue cards and some buildings can give you VP if your agents occupy them. – Let’s start with the amazing box and layout. This is the most organized game to play and clean up that I have ever seen. Every slot is made for good fitting and easy removal. Plus when you play the game, the layout is exact to where you leave all your pieces and cards. – This game is very dynamic. Your lord is random, so your strategy and objective change. There are buildings that are permanent on the board, but as players make other buildings, it gives you more options to utilize your agents with. The quests available are constantly rotating as well. Then just as you think you have everything, the intrigue cards can let gain supplies, attack players, and force lords to focus on annoying side quests. – While this isn’t a D&D game, for D&D fans this game holds a lot of flavor text and lore within the cards. I will admit, I usually get straight to the point of my cards but it’s always there if you want to take the time to review them. – The adventurers are represented by colored squares. I’ve read some reviews where people are upset about this. This doesn’t bother me as much but it’s worth mentioning since I’ve seen several bring it up (it is D&D afterall). – There’s no interaction between lords, other than to thwart one another with intrigue cards. – While the Instructions were very good for the most part, I did get confused on the sequence of turns. The instructions tell you that you can place one agent on your turn, but they don’t tell you that the actual turn/round isn’t over until all agents are placed. In a separate area of the booklet, it does tell you that all agents go back to the agent pool at the end of the turn. Very small issue, but still should have been included in the turn walk through. Let me be the first to admit that these probably shouldn’t be compared against each other, because they are different beasts in their own right. But both are Euro Games and Catan is one of the most famous. That being said, I feel that Catan has a good edge on Waterdeep when it comes to player interaction. Catan is a fun game, but the real meat of that game is the bartering with other players to get what you need. This forces others to be more social to achieve their goals. As for Lords of Water Deep, I love the fact that this game is dynamic. The city evolves because of the buildings being made and quests are always changing, depending on the type of quest. Sometimes you need to raise an army and sometimes you need to include money with your adventurers. I will admit that I’m also a little bias towards the theme of this game. Yes you are still gathering “supplies” to win, but the D&D side of me enjoys knowing I’m recruiting adventurers to do my quests. Overall Catan will always have a special place in my heart and I will continue playing it, but I feel that Lords of Waterdeep is a more fun and enjoyable Euro game. I was very impressed with it, and I would recommend it to anyone who like this type of game. Gloom is a card game where each player chooses a Family and makes them as miserable as possible, then you use kill cards to kill off the family member and collect the points on the particular member of the family. The more miserable they are, the more points you get. At the same time, your opponents will receive cards to increase happiness and will use them on your family to take away points. The cards are a nice see through plastic, which makes the cards good quality. Also because the cards are see through, they can be placed over the cards of family members, without covering the portrait. This is also used to cover up and counter scores put on by previous cards. Overall, I like the quality of the cards and I like the idea of the game but you ultimately get what you put into the game. Players who are not as creative might not entertain the group as much, where as eccentric individuals would make for more entertainment. Depending on the game it can drag from time to time, because it takes awhile to kill all 5 members of one players family which makes the replay value low. But strangely enough after enough time has lapsed, the suggestion of playing Gloom again sounds like a good idea. If the group is prepared for the duration of the game and they are willing to pour creativity into the game, Gloom can be very fun. Legendary is a Marvel themed deck building game made by Upper Deck. The setup includes a Mastermind that the superheroes need to thwart first, and then once they know that the mastermind is defeated, they brag about it over Shawarma and compare kills for an individual victory(just kidding about the shwarma.). I would compare the deck building portion of this game to Dominion and Ascension, those of you who are familiar with both. Each hero represents a certain theme of cards that will be put into the deck. For example, Gambit gives cards that can manipulate the deck and Deadpool does things that could hurt the party but are ultimately for his benefit. You pick five random heroes and this forms the hero deck that you will be using to draft cards. There is also a villain deck that is formed by 2 random groups and 1 group selected by the Mastermind card. Random things are also placed in this deck such as Masterstrike, Scheme Twists and Civilians. This deck is used to progress the Mastermind’s scheme and has a possibility of having the Mastermind win, in which the hero team loses and no winner is selected. – The Mastermind, Scheme and Villains are the saving grace to this game in my opinion. It gives a nice feel of villains actually invading the city and trying to stop them. Schemes also change what the superheroes need to do to stop them. – If you actually randomize the setup process, no game will be alike. The superhero deck can change as well as the villains, constantly changing the combos available and also changing how you thwart the Super Villain. – Setup is a disaster. Yes, having options to randomize the game is pretty cool, but the setup and tear down is very annoying. Hero deck is 5 random heroes that you shuffle together and later need to separate so you can pick 5 random heroes for next game. Villain cards are 3 groups of villains + Masterstrikes + Scheme Twists + Civilians, that also need to be shuffled and separated when you are done. If that wasn’t bad enough, Upperdeck doesn’t provide slots for card separation, they give you an empty squares with big cardboard dividers to separate the groups. – You don’t identify as one of the heroes. Heroes only signify the card type that you are putting into the deck, but anyone can get any mix of cards. – Co-op is almost nonexistant. Yes, technically the group can lose if they don’t step up to defeat the Mastermind but the entire time you play, you are thinking how to get yourself more points before everyone else by the end. – While there are several pieces of art for this game, you feel robbed on the heroes because they only use one art work for all the cards of that hero. Overall, I like that the game has options and fighting off the villains/mastermind is a nice different twist to deck building games. However, I have to admit that having both DC and Marvel deck building games, the DC Deck Building game gets way more playtime than this game does for the fact that it has an easy setup and as a comic fan I like that I can identify as a hero, where as in Legendary you never get that feel. I would recommend this game to those who play deck builders and are looking for more options/features out of a game. But if you do decide to invest, please be weary of the annoyance is setting up and putting the game away. Forbidden island is a game where a team has set off on a Forbidden Island to claim it’s treasures before it sinks under the ocean. Each member of the team has a role that gives them unique abilities that they are able to utilize during the course of the game. The “board” is a random placement of tiles that represent different locations. These locations begin to sink and eventually get swallowed by the ocean, giving you less and less options to move to and in some cases trapping you. Each tile shows a player’s starting location and 2 tiles are designated to pick up treasure from, so you don’t want these to sink before you get the treasure from them. Each turn you also collect cards, which can be a treasure card (4 different treasures) or utility item (there’s only 2) to help you in your adventure. For each player to pick up a treasure from a location, they need to have 4 of the same card for that particular treasure. The forces a lot of trading between players to get the right combinations so that you can pick up the treasure you are targetting. Once all treasure is taken, everyone needs to make it to the helicopter pad and you need a helicopter card to fly off and win the game. This game had some very good things going for it. The box is a nice tin that holds all the items for the game very well and doesn’t take much space. The roles are fun, making players feel they are unique and contributing to the overall success. It’s not a difficult game for new players to pick up and if you find it too easy, you can up the difficulty level which floods the island faster. My Con about this, however, is a very big one. The game is coop and you definitely feel that everyone is working for the same goal. However, the one thing that seems inescapable is that it becomes very “hive mind.” What’s wrong with that? The game is coop afterall right? But the thing is, if you play with someone who knows how to strategize quickly or if they are the Alpha type personality, you are often told what you need to do to succeed. New players who are learning don’t really get emersed and will easily go on auto pilot because they will see that the options being told to them are usually optimal anyway, so they often follow their guidance. Even with 4 skilled players, it’s a little hard to feel like your activity is of your own original thought which eliminates the feel of personal accomplishments (even if they are for the team). As a casual family game, I can see this being more successful. However, I would not recommend this game for a group with power gamers. My friend had this game sitting in his car and he kept hinting we should play it. The thought of playing an anime looking game wasn’t very attractive to me so I kept pushing it off for other games we were familiar with. Well one day we gave in and needless to say, we ended up ONLY playing this game. For those of you who haven’t read other reviews, it is very similar to Bang, where you hide your identity to the group and try to fish out your allies and enemies. There are two main sides, which are Shadow Hunters and Shadows. Then there is the wild card, which is the Neutrals. Shadows and Shadow Hunters primarily just need to defeat the other side, while Neutrals mainly have their own alternate motives which tend to confuse the group from finding the opposing side. Each character has a special ability that is caused by different triggers, but each character is unique. The game board has locations, which mainly give you cards but they also have abilities to do things to other players. This also determines your ability to attack other players as well. Like Bang, you get cards that are either equipment to buff you, heal cards, damage cards, and even trap cards that do bad things to you. However, an added card type are Hermit cards, which are secret cards between the player who obtains it and the person they hand it to. These hermit cards hint towards people’s identities, so that you can start picking your battles. I actually prefer this game over Bang, for the fact that there is more mystery in who everyone is (depending how everyone plays). The game doesn’t drag, and has a quick flow to it once you understand the rules and people who die usually don’t have to wait that long for the game to finish unless there is some lopsided circumstance. It’s a very social game that doesn’t take very long and it has lots of backstabbing :). – It’s easy to pick up and play. There are a few rules that need clarification from time to time, but for the most part it’s easy to catch on for what you need to do. – Easy setup and tear down. – In addition to building a deck, you play as a hero that can provide you benefits and ultimately guide your strategy. – Being simple is good and bad. Those of you looking for something that is more complicated and includes more options, DC is a simplified version of deck builders. – Cards are themed after heroes, but can be acquired by anyone. For example, batman’s utility belt can be acquired by Aquaman. This doesn’t really bother me so much but I’ve seen some critics who feel that this takes away from their particular hero. I’m a big Ascension Fan, and at first I thought this game was fun but simple. However, my roommate and I began playing it more and more because it was so easy to just set it up and play a short game. I will also say that as a DC fan, the theme really helps. It’s really nice to see all the heroes, equipment, villains and superpowers that you come to love. I would recommend this game. Usually I like to play with at least 5 people in Shadow Hunters, but in a 4 player setting, even though the recommended is 2 shadows and 2 hunters we prefer to play with 1 hunter, 1 shadow and 2 neutrals. It keeps the mystery lively. X-Wing is typically a two player game (Rebels and Empire), but I’ve done a few multiplayer games where we’ve had each player control a ship. Works out just as fun. However keep in mind that you will have to work closely with your copilots to win. Sometimes when there are a lot of players, the game can drag out quite a bit. Here are some ways to help create a faster game. – Lower the level requirement to win. – Add extra treasures to the beginning hands. This will help give players a standing chance against monsters. If you find yourself falling behind in points because you are unable to gain Super Villains, try to buy the right cards in the line up. Utility Belt – worth 5pts when you own 4 or more equipment. Green Arrow – worth 5pts when you own 4 or more heroes. Suicide Squad – each card is worth as much as the amount of Suicide Squads you own. If you have the opportunity to pick up Robins and Bat Signals, these combo quite nicely out of the discard pile. Bat Signal: +1 power and put a hero from your discard pile to your hand. Robin: +1 power and put a equipment card from your discard pile to your hand. 2 Robins and 1 Bat Signal are in your discard pile and you get 1 Bat Signal in your hand. Use Bat Signal to obtain Robin > Use Robin to gain Batsignal > Batsignal for Robin again > then Robin to get another random piece of equipment. This gives +4 power and another equipment card of your choice. Note that having multiple daggers does not stack the abilities on each attack. Multiple daggers gives Filtch multiple attacks, but each dagger only gets the ability per attack that it is used for. Filtch has 2 daggers that remove 1 defense die from a minion and uses knife strike. Wrong Method – stacking both, taking 2 attacks that remove 2 defense die per attack on minion. Correct Rule – take 1 defense die per attack. Right hand attacks, uses ability to remove 1 defense die. Then Left hand attacks, using it’s ability to remove 1 defense die. In both attacks, only one die is removed. Brodie Chases is an ability of Brodie where he bounces from mouse to mouse causing damage in his path. Note that this ability affects all minis in it’s path. If Brodie is moving from Mouse A to Mouse B, all minions in the middle are also hit. Cheese Surges are used to keep the game going along, and it certainly does the job. However, here are a few tips that have helped me so far. – If a surge is nearing when you are done with an encounter, check to see how many pages you have left in the chapter. If you still have a few pages, you may want to take that surge in the current tile, so you don’t get double the encounter in the following tile. – If there is one enemy left and it is the last characters turn, you might want to consider leaving the minion alive until the next turn so that the surge wheel doesn’t get another cheese for having no minions at the end of the turn. – Make roaches priority. Roaches initially tricked me when we first started. They are only roaches after all, right? But the truth is that roaches can set off the surge wheel faster cause they get twice the cheese. Every time they hit you and every time they roll a cheese. This makes encounters come out more frequently and makes them more difficult. Do yourself a favor and get rid of them asap. Edit: Roaches tip only applies to hungry or greedy roaches, as they are the ones that set off the wheel when hitting you. But you probably want to get rid of several easy minions who get more attack rolls + cheese on attack and defense anyway. Speaking primarily on the original Munchkin game and it’s several expansions. When I first tried the base game, the reason I enjoyed it was because it was balanced from low level to high level monsters which created decent progression. Over excited about the game, I purchased several of the expansions and shuffled them in at once. While it’s great for more variety, it becomes seemingly hard to get a monster to defeat in early levels. Still fun, but this can cause a game to drag sometimes. Some would tell you that if you go second and decide to be Assassin or Thief, that you should try to hit the first player, which gives you a 50/50 chance of knowing what they are. Targeting first player – 2 cards to choose from. The card that is randomly placed faced down and one that they actually picked (50%). Note this can also be considered when going second to last in the rotation. One of the house rules that my friends and I use, is that you’re able to barter with other players to allow you access to their port. Meaning if player A controls a sheep port and player B needs to use it, he can offer resources to player A to allow B to trade away his sheep. There are going to be areas that will look like great places to pick up early resources to build roads and settlements. However, if these are not available to you, try monopolizing a resource that everyone is going to be short on. Then plan ahead and also build towards a port for your monopoly. This way if players won’t trade you, you can still cash in your monopoly efficiently to gather other resources. One house rule that my friends and I play with, is when someone uses the general store the cards are lined up as normal and the person who played the card gets first pick. However, after the first pick has been made, everyone grabs a card they want at the same time. This adds more chaos and hilarity to the game. Black Widow has a card that gives “+1 attack per bystander in your victory pile.” Black Widow cards are already geared towards collecting bystanders to help this card, but if you combine it with Spiderman’s Web Shooters which is cheap and lets you rescue a bystander every time you play it, this combination can lead to a large smack from Black Widow. When I first got this game, it was really hard to feel the coop or sense of danger for that matter. To remedy this, I followed instructions to up the difficulty, adding more scheme twists, upping the mastermind’s hp etc. While I still feel the coop is a little bit lacking, you will find some situations where you will need to make decisions to benefit the group instead of being out for yourself. If you already haven’t discovered this or played Aquaman very often, I would recommend trying to scoop up locations out of the line up. Reason being that locations are just enough cost for Aquaman to place it on top of the deck. Once you get the location in your hand, you may play it and leave it out permanently since there are no cards that gets rid of locations. This gives you the benefit of the location immediately and you also get to remove the location asap, so that it doesn’t hog room in your deck for other cards. Robin – allows you to grab an equipment card from your discard pile. Bat Signal – allows you to grab a hero from the discard pile. If you have a card in your discard pile to benefit off these, it will give you 2 cards for the use of one card in your hand. If you play one more card that is worth more than 1 cost in your hand, you can get GL to activate his ability of plus +3 power. Also on that same note, for bigger games, cards such as Starro and Xray vision can also give you a 2 for 1 if your opponents flip something with 1 or more cost. Here is my personal ranks of the Super Heroes. This is based off my experiences in a 2-3 player game, and of course there are always exceptions with the right luck. Also unable to rank Manhunter due to not having the promo. 1. Aquaman – Aquaman starts out strong and the ability to use cards you obtained for next round, is very strong. You can create combos this way and even locations get flushed out of your deck faster. 2. Wonder Woman – There are few villains that Super Heroes feel they need in their deck and no other heroes have abilities that chain off villains. Most other times villains are killed because there was nothing better on the board. This gives Wonder Woman the opportunity to focus on villains and constantly activate her ability to draw extra cards, and there is no limit to how many times you can do it in one turn. 3. Cyborg – His ability is limited to once per turn, but he has flexibility in both equipment and super powers. 4. Superman – His ability is a nice buff that is unlimited off super powers. While very similar to batman, the benefit is that if the lineup is not very pleasing, superman can always get kick cards that count as a super power. 5. Batman – Batman has a nice unlimited buff like superman but has no fallback card to purchase if equipment is not available. Equipment is also highly sought after for defenses and other perks. 6. Green Lantern – His power is versatile, so it can benefit off any kinds of cards but I can’t help but feel this is best mid game. It takes awhile before you get 3 cards to give you the bonus unless you are lucky and in end game the most you can get is 3, where as superman and batman can go above 3. 7. Flash – Going first is ok but nothing fancy. The ability to draw and extra card is nice, but it’s limited to once per turn and all other heroes love to have draw card abilities as well. So you are competing to get the cards you benefit most from. Leave Flash at the bottom for me. This is just my take. I definitely feel there is some wiggle room to shift the ranks and I’m honestly most shakey about Green Lantern. I hope this helps! As a kid, I always enjoyed video games and as I grew up, my addiction grew and video games demanded a lot more of my time. Most friends that I kept up with were friends that played video games with me. When I finally realized that I needed to back off video games, I realized that board gaming was a good balance of entertainment and socializing. I’ve never been big into parties (unless someone else is hosting) but having small gatherings was always fun to me. And depending on the board game you play, you don’t have to sink a bunch of time into it. Continuing Mice and Mystics campaign! I just got Waterdeep and played it for the first time. Unfortunately we only had time for one game, but it was fun I’m looking forward to playing it again today. Also played DC Deck Building game and Battle Star Galactica. This looks like it might be like cards against humanity, but with visuals? Would like to see a review on it if anyone has played it. @Jerry thanks again for the information. Also out of curiosity, in future expansions are you planning to include another set of dice? 🙂 Or maybe sold as additional accessories? I just finished a full day session to get through the rest of the chapters. hen we reached chapter 9, we found a passage saying that unlike previous chapters, all gear found can be kept for the next chapter. Ultimately making me realized we played the other chapters incorrectly. My question is how far does the reset go? So each chapter with the exception of last three chapters make you reset your gear, but what about abilities, cheeses, and party items? Stonemason – I think the replay value definitely diminishes, because you lose the surprise of the story/encounters. However, I think there is still replay value because I would compare it more to a video game than a book. When you play a video game and fight through a level and boss encounter, when you replay it you know what’s coming but doing it again doesn’t mean it won’t be fun anymore. If you’re afraid you won’t get your moneys worth, I can tell you that you spend a good amount of time on each chapter. The other night we did 3 chapters that took us about 4-5 hours. Sometimes, I want to replay the chapter just because I find out that we did some rules incorrectly as well. Let me know if you have more questions about it. P-Cokes: I also read out the tile ahead of time. While I administer the game, I’m also a player and it’s not fair for me to know about special searches while the other players do not. They might think you’re trying to hog the glory/items for yourself. -Draw a new encounter card and discard the old one. -Special encounter tiles replace the card. -After a surge has taken place. Page 15, step 3 of surges. The last one is the one I never saw. Thanks for the clarification guys. Sounds like I was playing it right if what you guys are saying is true. I just found it weird that the surge explanation mentioned there not being an encounter card at times and I never saw points of the game where there is no card (with the exception of special encounters). I think I should clarify my question a bit. Let me provide a scenario + rules. If I understand the rule correctly, when you go to a tile for the first time and there are no special encounters, you flip an encounter card and leave it face up on the deck for surges etc. Tile 1 – no special encounter, so we flip up the encounter card and fight off the minions. Then we explore tile 2. Tile 2 – has a special encounter from the book. My question is, does the encounter card from Tile 1 stay face up? Or do you clear it since you got a special encounter in Tile 2? I haven’t seen anything that says when to clear out an encounter card. I’ve only played the first chapter, so I don’t even know if this situation will ever come about. So I have a follow up question to that. Are there instances when the special encounter is not on the first tile, but a follow up tile instead? If so, do you discard the encounter card from the previous tile? Example, Tile one has no special encounter so you use the encounter card. Second Tile has a special encounter. Do you discard the previous encounter card when you first explore the second tile even though you are not flipping a new encounter card? Currently I live in Austin TX. I used to like deck builder games but more and more are coming out and I can't keep up. Currently playing DC Deck Building Game, Legendary, and Ascension as deck builders. However, I'm also open to most other games. Mice and Mystics, Battlestar Galactica, and Lords of Waterdeep are some of my other favorites.